Item is a photograph taken during the unveiling of a monument commemorating the British invasion of Castine, Maine, where they collected customs duties that funded the construction of Dalhousie College. The unveiling happened during a Dalhousie reunion in 1938. 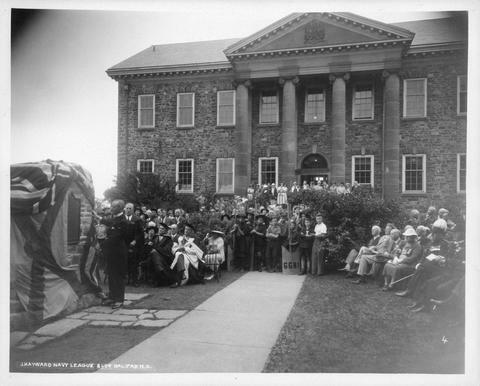 The photograph shows a large group of people sitting or standing in front of the Arts Building (University Club) as an unidentified man unveils the monument.